The single best athletic activity that athletes can do is yoga. Athletes put their bodies through grueling tough stress on a daily basis. Often they are doing the same movements over and over again. Imagine a baseball player who swings from the right hand side. He can develop an imbalance in his obliques, hip flexors, and lateral rotators of the hip. The largest and most often used of these is gluteus maximus. Sticking with the baseball theme, have you ever noticed that baseball players only run in one direction? Tightness in the hips can lead to not being able to change directions as quickly. A tight hipped athlete is a slow athlete. When you study any sport you will find areas where overuse injuries hinder athletic performance. Yoga can also be used as part of a strength program. Especially for the older athlete who has spent many years developing their base with lifting weights. There is only so many times you can keep increasing the weights before something has to give. Take a look at my last post, “Mr. Universe doesn’t have a Jump shot”, to find out how I feel about single joint exercises and athletic performance. Anyone who has held a warrior 1 or a chair pose for a minute can tell you how tough yoga can be on your legs for muscular endurance and strength. One of the NBA greats Kareem Abdul Jabaar started doing yoga way before it was trendy in the 1970’s. He only played NBA basketball at 7 Feet tall until he was 42 years old. He ended his career as the NBA’s all time leading scorer. Another more current NBA player is also a big fan of yoga for his workouts. Baron Davis of the Clippers is also a big fan of yoga. In 2007 Men’s Health magazine voted him as having the best body in professional sports. He has started kind of a trend among other NBA players by bringing in his personal coach Kent Katich to help his teammates understand the benefits. A lot of times when someone brings up yoga the immediate response is not good. 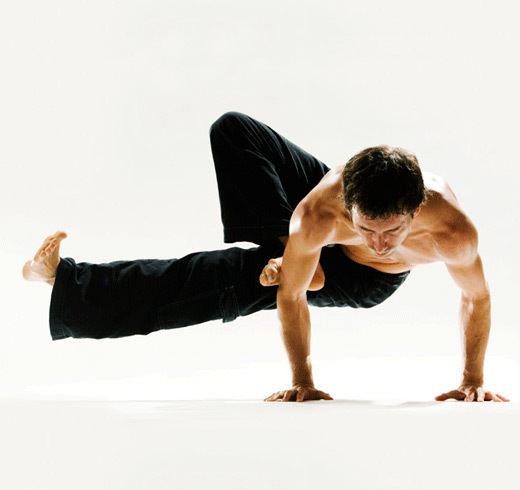 Men overall and athletes tend to think of yoga as not being too manly. Kent Katich has countered this with blaring hip hop music during his yoga sessions with the NBA’s Clippers. He also doesn’t refer to poses as their traditional yoga names such as fish pose and Crow pose. He instead just told the players how to place their bodies in the positions. Bend forward and touch your toes sounds better than swan dive to professional athletes. Another person I am a big fan of is Mark Vergesten of Core Performance powered by Athletic Performance in Arizona. Mark is the director of player performance for the NFL player’s association. He has helped countless athletes get combine ready at his facility. His website has a section called Movement Prep. If you look at all of the videos you would realize they are all yoga poses. Taking your body through it’s full and natural range of motion will help stretch and lengthen tight tight areas that are in need of a makeover. Movement prep shows your body how it should be able to move. Most often for people who have never done it they quickly realize that their bodies don’t move that way. Competitive athletes should wonder why and try to fix these postural alignments. Once again for whatever reason the word yoga can bring about fear and hatred at the same time. Movement prep sounds more scientific. Athletes don’t have a problem doing movement prep. A lot of people work out constantly. What makes some of them elite athletes and others just a step slower to react in athletic situations? Posture may be a key factor. Your body was designed a certain way. Throughout our lives this posture breaks down over time. Every day life can lead to a hunched and rounded upper body. It also can lead to a pelvis tilt which can be caused by tight hamstrings and can lead to lower back pain. In the time I have been sitting here typing this article I am hunched forward with my shoulders rounded toward the computer and an unnatural curve in my lower back. Many people spend their lives at desks writing or typing on a computer. Imagine what this does to our bodies. People who drive for a living and spend hours in a car often have short and tight hip flexors. This inhibits the ability of the glutes to fire properly which can stretch the lower back to a point of chronic pain. Athletes break down their bodies even more by their performance but everyday people also have postural issues as well. If you have pain in your lower back or you have limited movement in your shoulders behind your head you need to try yoga. Most elite athletes have their shoulders drawn back and a nice natural S curve in the spine. This represents a balanced athlete whose body is in it’s natural state and ready to perform. Our ancestors were hunters. They needed to run to get food to feed their families. When we bring our bodies back to that of our natural ancestors we can best perform. Yoga is something that every person should try and especially athletes should do on a regular basis. Don't think this is athletic?